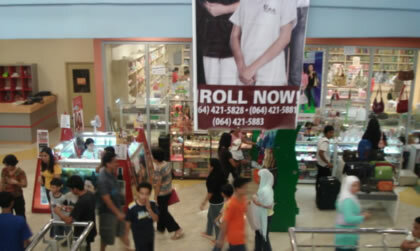 at Cotabato City's First Mall. South Seas has job opportunities for those interested in pursuing a career in the retail and food service industry. Please send your resume to our Human Resouces Department and we will contact you if there is a match with any of our openings. Job openings/listings are posted at our Customer Service Center. We look forward to seeing you soon and, hopefully, welcome you aboard to the South Seas Mall. 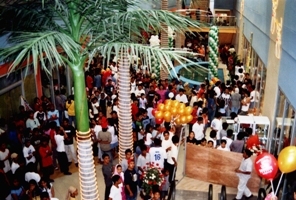 After much anticipation and a long wait, the South Seas Mall, Cotabato City’s first mall had a remarkable opening last December 10, 2005. Thousands of people from the city and the adjacent provinces of Maguindanao, and North Cotabato flocked to the mall even though only the ground floor of the store was open for the public on the said date. Such was the turn out of people that one of the escalator’s glass siding shattered and hand rail damaged. Little accidents like this, however, are viewed as a good omen by Chinese businessmen. The glass door of the local Jollibee outlet was also shattered during its opening some years back and the store has been performing exceptionally well since then. 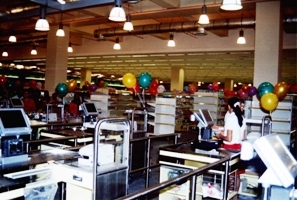 The locators at the first floor of the three-storey mall include a modern supermarket, Greenwich, Chowking, a wine and liquor shop, and a bakeshop. A department store is at the center of the second floor which also contains a Bench shop, toy store, and wine and perfumery section. At the top floor is a function hall that can accommodate at least 600 persons for conventions, parties, fairs, and other occasions. Major stockholders of Store Zone Corporation invited government officials, captains of industries, family friends and other members of the local community to the formal opening of the South Seas Mall Complex. No less than the former president of the Catholic Bishops Conference of the Philippines (CBCP), Cotabato Archbishop Orlando Quevedo gave the blessing at the main entrance of the mall. In his address, the city mayor Muslimin Sema thanked the owners of the mall for their faith in Cotabato City and their persistence in business despite the difficulties that they have endured throughout the years. In 1976, for instance, the SouthSeas store located along Jose Lim Street was leveled to the ground due to the very strong earthquake that hit Cotabato City and most of Mindanao. 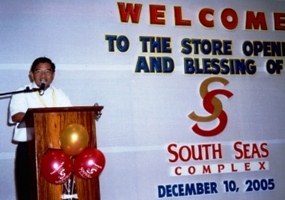 Notable personalities that attended the opening of the South Seas Mall included Vice-Governor Datu Bimbo Sinsuat of Maguindanao, former Cotabato City mayor and National Historical Commission head Ludovico Badoy, and the leaders of the four business chambers, other entrepreneurs, and city and national agency officials. The opening of the mall project that involved a substantial investment capital as well as, the influx of other franchises and other investments such as Goldilock’s, Penshoppe, Kuryente, and is a strong signal that the business sector believes in the future of Cotabato City. Based on casual interview of managers of establishments located near the mall, the numbers of people visiting their premises have increased by at least three-folds. Strolling the length of Don Rufino Alonzo Street, it becomes obvious that Cotabato is undergoing a major facelift. A huge, imposing structure, boldly painted with a splash of fuchsia and mint green now dominates part of the area, dwarfing the smaller buildings beside it. The new landmark houses South Seas, the city’s first and only mall. The opening of the giant shopping center not only excited the local shoppers, and elicited the interest of new investors in Cotabato; it pleased the owners of small, local business as well. Engr. Mohamad Basar, owner of a chain of hardware stores and Chair of the Muslim Chamber of Commerce sees the positive signs that occurred immediately after SouthSeas opened its doors. “It only meant one thing: people residing in nearby provinces and municipalities will no longer have to go to Koronadal, General Santos or Davao to shop,” he says. Basar foresees that the mall will attract more people to do business in the city. “We are never threatened by its presence, and in fact, welcome it. The more people coming to Cotabato, the better for all of us,” he adds. He based his contention on the unexpected increase in sales in the past months. “Surprisingly, sales increased right after the mall’s opening. I now have a new list of non-repeat customers coming from nearby municipalities,” Basar discloses. Inside South Seas Complex / Mall, a fountain decorated with artificial coconut trees cheerfully welcomes shoppers. On a Thursday, at 11 a.m., the mall is surprisingly full of people. 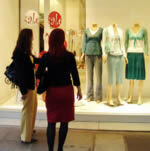 Students and young professionals troop to a store that carries a popular local brand of apparel and check the window display of trendy tops and jeans. 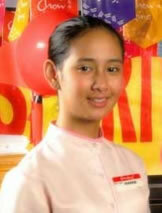 Restaurants of various fast-food chains fill with office workers, students, and women garbed in traditional Muslim attire, with children of varying ages in tow. Everyone seems to be in a mood to shop or dine. The Mall serves not only the consumers of Cotabato City but also residents of neighboring areas who come from as far away as the provinces of Maguindanao, North Cotabato and Sultan Kudarat. In response to increasing business activity in the city, the Department of Trade and Industry–Cotabato City is focusing on improving the area’s business incentive code and promoting the competitiveness of local business establishments by introducing new and innovative business systems. Don Rufino Alonzo St. and at S.K. Pendatun Ave. Note: You will pass thru an electronic security check. The South Seas Gift Check are on sale at the Customer Service Center. Payment can be made by cash and any major credit cards. These Gift Check can be exchanged for goods and/or services in any of our South Seas stores. Bench/ at the South Seas Mall has the latest trends on tops and jeans. Take a break from work !!! Great tasting fried chicken cooked to a golden brown crisp, with tender and juicy meat seasoned to perfection. Signature Fragrances and Perfumery are available at the South Seas Cosmetics Dept. Whenever I get the chance to go back home for a vacation, South Seas is a must to see. © 2006 South Seas Complex / Mall. All rights reserved.